Carte de L'Afrique dressee ET dessinee sous la Direction de Mr. J. G. Barbie du Bocage. An uncommon and extremely attractive 1852 map of Africa by J. G. Barbie du Bocage. 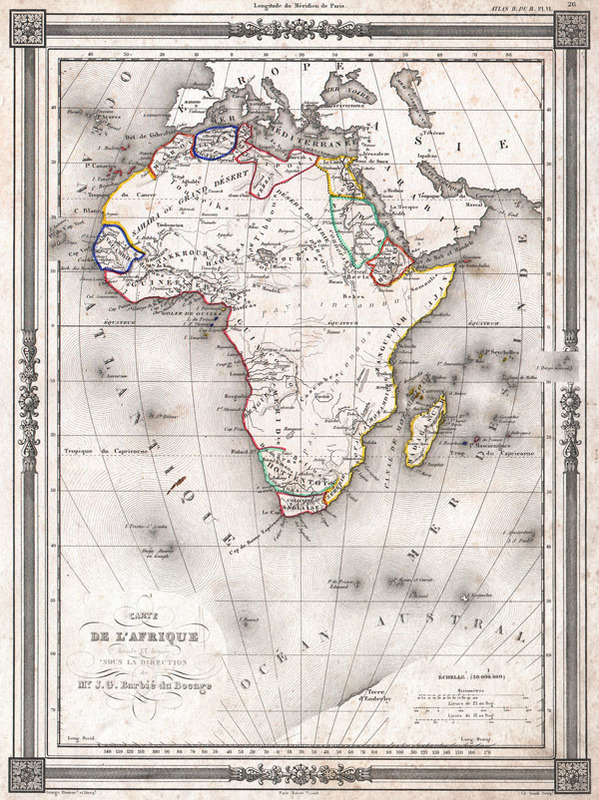 Shows the continent of Africa situated high on the page. Labels the costal kingdoms and colonies including Zanzibar, Biafra, Senegabia, Algeria, Maroco, Abyssinia, Nubia, the Cape Colony and Egypt. Also denotes various tribal regions including the lands of the Hottentots, The Bambara, the Behrs and others. Most of central Africa is simply labeled 'Pays Inconnu.' Part of the Antarctic continent is shown as Terre d'Enderby, referring to the Enderby brothers who owned the ship Tula that, captained by John Biscoe, discovered the territory in 1831. Enclosed in a beautiful frame style border. Prepared by J. G. Barbie du Bocage for publication as plate no. 26 in Maison Basset's 1852 edition of the Atlas Illustre.